This modern lampshade design draws its inspiration from a classic lampion shape, hence the name – ION. The composed form follows the principles of curved paper folding techniques to make the lamp´s thin shell translucent and strong at the same time. 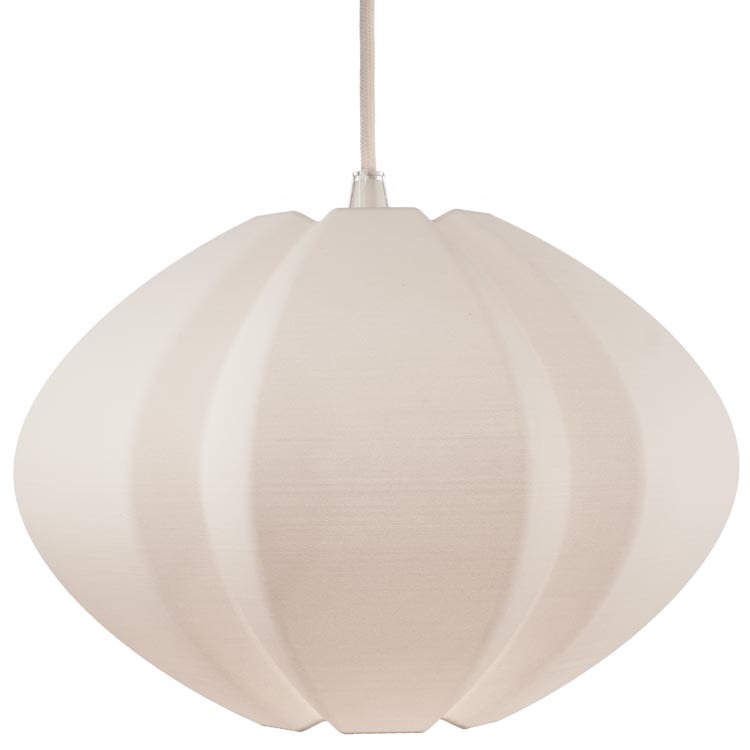 During daytime the bright white, curved shape adds a clean, yet homely accent to your interior. When turned on in the evening ION illuminates the space with a warm, soft glow to the sides and a focused spot of light to the bottom. ION is available in two sizes and can be hung as a single lamp as well as in groups forming lines or clusters. The pendant light is 3d printed on demand in a thin nylon material. The fine layers of the printing process produce a matt finished, paper like structure. When lit the horizontal lines softly shine through and evoke the feeling of a fabric lampshade. Wipe with dry cloth or clean with warm water & soap. Use a standard E27 Lamp fitting with screw mount to fix the lampshade. Alternatively you can also use a lamp stand to turn ION into a floor or table lamp. > Download the ION datasheet here.